-Hurricanes form in warm ocean waters. As you know, warm water turns into water vapor quickly. A lot of water vapor rises and forms cumulonimbus clouds. Strong winds blow the clouds into swirls. As the clouds get more and more water vapor from the sea they become larger. That's how a hurricane forms. What is a HUrricane eye? 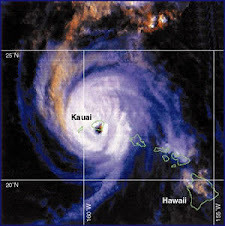 -A huuricane eye is a lot of clouds swirling around in a circle. In the center are very few clouds. If you looked down on a hurricane from above you'd see a hole like an eye in the middle of the clouds. That's why a hurricanes center is called the eye. 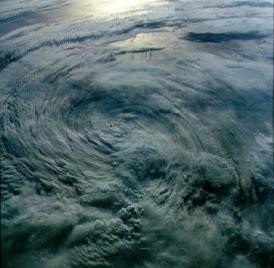 Why do hurricanes bring such heavy winds? -Inside a hurricane are a lot of rain clouds, and they bring heavy rains. -Near the center of a hurricane the air is pushed up with great force. When that happens other air rushes in to take its place. That's why the wind is so strong.